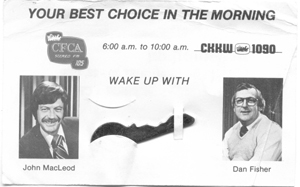 So from this very young, skinny fairly newbie announcer [about 5 years into the biz] you can see the development to what I became in the final year of on-air duties as the morning man on CFCA in 1994. I attribute it to all those great years of schnitzels, sausage and beer! What else could it be??? And here's a very happy, satisfied announcer guy, after 33 on-air years in Kitchener/Waterloo. 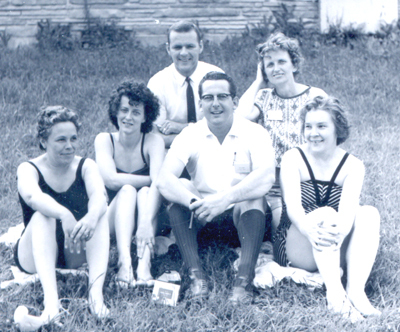 A guy who brought his family here in 1961 and immediately fell in love with the community and decided right away that this was a fantastic place to put down roots and raise a family. Below, a couple of pictures of a promotion we ran with CJOY, and DJ Jimmy Rodgers ~ took a load of listeners to the Bay City Motor Inn in Owen Sound for a day of pampering and splashing around in the indoor pool. 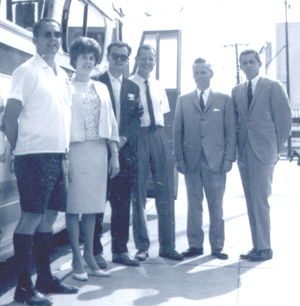 There's bus driver Norm Young in the back row, I traveled with him hundreds of times over the years as he drove the coach for the Kitchener Rangers. 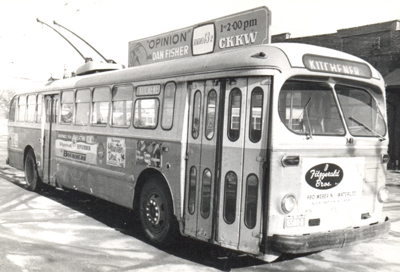 Norm later gave up the highway busses and joined Kitchener Transit, he's retired now. John McLoed was the morning man on CFCA while I was doing the same gig on CKKW, the stations thought it might be a great idea if we combined a promotion that involved listeners getting a key that would open the grand prize box, so these cards were distributed to listeners...may the best person win!! 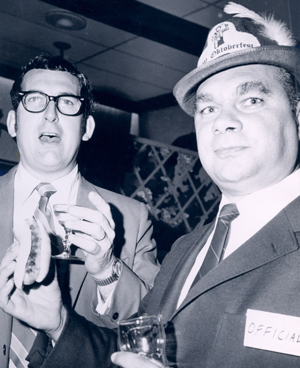 Here's Gunter Jessat offering to share an Oktoberfest sausage, mit sauerkraut and Oktoberfest mustard ~ my mouth is open, but I don't seem to be getting any. I believe Gunter was the President of one of the German clubs at this time in the early days of the festival, but I can't be sure of that, or of what club he was the President of! We're going back a few years for this lineup, wow! 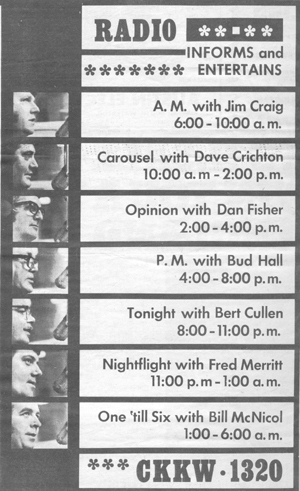 Jim Craig was doing mornings at that time. I had snatched him from CHYM. Wild and crazy Dave Crichton did the mid-morning show, he replaced me in that time slot, as I moved to the talk show. I have never met a guy as talented as Dave is, you hear him on tons of national and regional commercials on radio and TV these days. 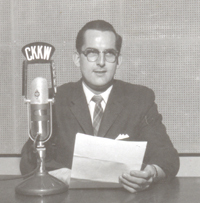 Bud Hall was a trooper, he came aboard from CHML where he was an institution for many years. 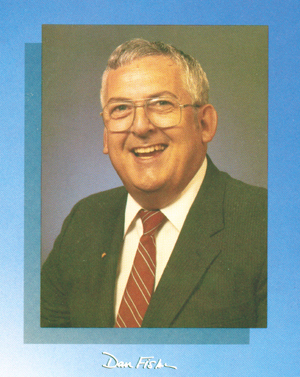 He was truly a great radio pro Bert Cullen was also a veteran of the radio wars, can't remember where I got him, but he served the station well for several years before moving on to Simco where he retired. And there's Fred Merritt, I got him from Chatham. He eventually moved to CFCA and is still on the air locally at the community station CKWR  Bill McNicol rounded out the on-air crew. He retired from radio and has spend the past 20 years as an employee of Canadian Tire on Weber Street in Waterloo. Say hello for me! I did a radio talk show "Opinion" for about 18 years. It was very popular in the Region, and over the years it varied in length from one to two hours, then back to one hour. Guests on the show included Prime ministers, MP, MPPs and of course local political types. I regret that I never kept a diary of the guests on the show, the list would have made a great book, relating my memories of what type of people they were.